How Can We Make Ourselves More Intelligent? The recent post suggested that trading ability may be more linked to intelligence than is ordinarily acknowledged. That is because intelligence embraces both crystallized knowledge (what one knows) and fluid abilities (what one can do with what one knows). It is the latter, fluid abilities--not the crystallized information that tends to be tapped by achievement tests--that are most like trading, where reasoning in fast-moving situations is critical. Can people become more fluidly intelligent? Despite early views that intelligence is rather stable across the lifespan, more recent research suggests that it is indeed possible to increase fluid intelligence. Training in a task involving working memory extends to performance on fluid intelligence tests that are not directly memory related. Moreover, there is evidence that suggests that more training produces more gains in fluid performance. A version of the game used in that research to improve fluid intelligence can be found here. What is interesting is that the game requires good short-term memory, flexible thinking, and rapid thinking. All are skills very relevant to trading. Researchers hypothesize that the boosting of fluid intelligence strengthens the brain's executive functions by aiding problem solving. This is opening the door to apps specifically designed to make us more fluidly intelligent. There are two big implications of this research. First, it may well be that the right kind of deliberate practice in simulation mode not only teaches trading patterns and skills, but acts as a fluid intelligence booster. By requiring traders to reason quickly in moving markets and providing them with immediate feedback regarding their decisions, simulated trading could be good brain training. Game playing could be great training for trading. A second implication is more profound. Perhaps traditional trading psychology has had it all wrong. What if it's not lapses in discipline and emotional interference that lead to bad trading, but rather failures of fluid intelligence? If traders do not hold the right information in working memory and can't juggle that information in real time to make quick decisions, that could easily lead to frustration and other emotional interference. The cause of the trading problems, however, would be a lack of fluid thinking, not the consequent emotional reactions themselves. If that is the case, perhaps what losing traders need is brain training and not sessions with the shrink! Further Reading: Could Chess be a Form of Fluid Intelligence Training? Here's an update to the recent posts on weak breadth in the stock market. The above chart tracks the number of common stocks across all U.S. exchanges that have made three-month highs vs. lows . 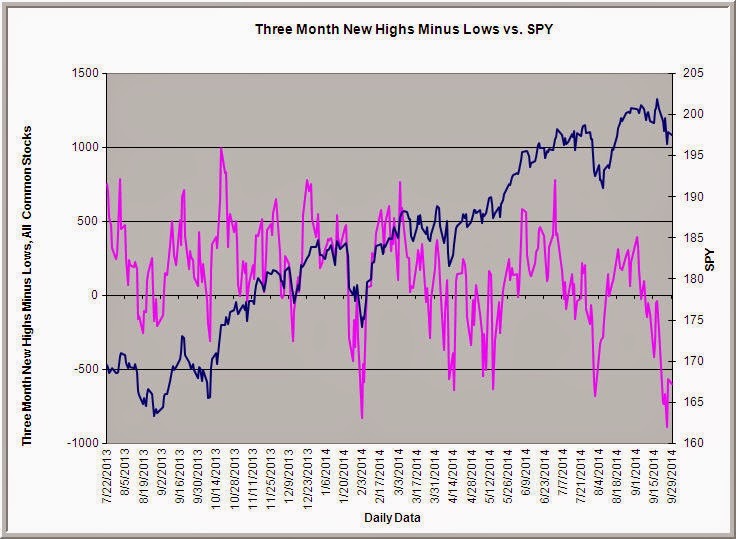 You can see that the new highs minus lows measure was quite weak at the recent market peak and now new lows have fallen below their early August level. This continues the pattern of weak breadth. Note, however, that new lows bottomed thus far on 9/25 and have held above that level. Interestingly, my measure of Buying Pressure has registered above average levels for the past two trading sessions. It appears that the recent low levels have attracted fresh buying interest and the first signs of downside divergence are appearing. So far, we have seen price lows with weaker breadth, but those lows have occurred at higher price levels. Thus far, nothing is happening to alter that pattern. An important distinction emphasized by cognitive psychologists is crystallized vs. fluid intelligence. Crystallized intelligence represents what we know, our storehouse of knowledge. Fluid intelligence represents our "how to" ability: our capacity for reasoning and dealing with new and unfamiliar problems. Interestingly, what improves crystallized intelligence does not necessarily improve fluid intelligence and may even interfere with our fluid capacities. Our ability to solve problems in unique and unfamiliar areas is not advanced by having accumulated more information, but creative activities--such as performance in the arts--may build our ability to handle new situations creatively. Physical activity also appears to be linked to improvements in aspects of fluid intelligence. There is provocative evidence that video games can improve brain connectivity and hence fluid intelligence. Recent research has shown that this translates into better school performance for children, as well as multitasking skills. This is important, because it shows that quick, adaptive reasoning in one situation can build the capacity for similar capacities in other domains. 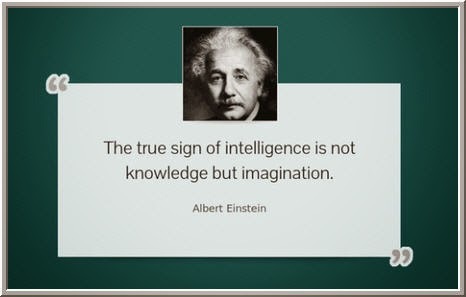 Discretionary trading is a great example of an activity that requires fluid intelligence. We can read and memorize information about markets until we have an encyclopedic database, but that does not cultivate the skill to reason and function in uncertain and rapidly changing markets. Pattern recognition is an important aspect of fluid intelligence: the ability to understand new situations based upon patterns experienced in similar situations. We commonly hear that the best traders are not necessarily the ones with the highest IQs or the most college degrees. That is true to a point. Crystallized intelligence of the type tapped by standardized tests may be poor predictors of performance in fluid situations. When I taught full time in a medical school, a research finding that interested me was that medical school admission test scores predicted grades in medical school courses, but did not predict performance in clinical education, which focused on patient care. That doesn't mean that intelligence is irrelevant to trading. It may well be that great traders are fluidly intelligent: they may not have the largest databases of information, but they are good at knowing what to do with the information they have. If this is the case, then more fundamental analysis and more technical analysis and more statistical analysis will not make someone a better trader. What will boost their trading performance is cultivating their fluid intelligence. This has important implications for the education and training of traders and portfolio managers. * The future is looking bright for podcasts. Check out a group of very good market-related podcasts assembled by Abnormal Returns. 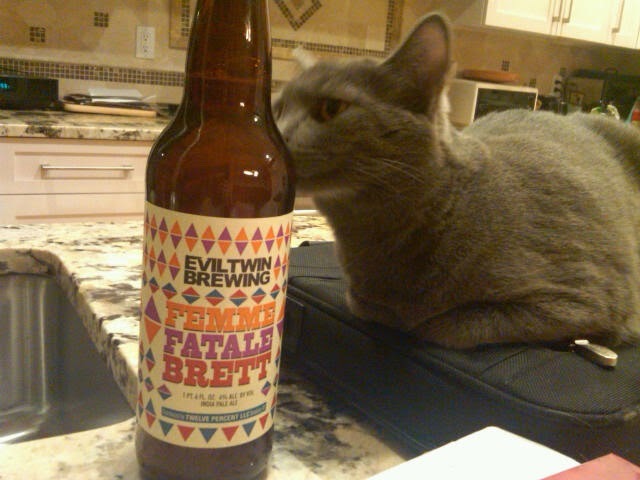 Well, you have to admit: Mia has great taste in craft beer! I recently wrote about the value of professional networking for traders and mentioned that I would be organizing a networking event. What I've found is that, even for traders working within firms, it is easy to go stale by reading the same kinds of material, talking with the same people, doing the same trading. Eventually markets change and the risk is that they leave us behind. This is a particular occupational hazard for traders who operate independently. Isolation means that you have less access to fresh ideas and perspectives. Social media has been a big help in replacing isolation with networking, but it is limited. Forging ongoing professionals relationships and discussing new ideas in depth is something best done in person. Hence the networking event! This initial networking event will be for traders in the greater New York City area. Specific date and location are to be determined, but will probably be after market hours on a weekday in either NYC or suburban Connecticut (Stamford, Greenwich). The availability of interested participants will determine the final date, time, and location. You can count on a destination with craft beer that Mia would approve of! Here's the catch: Each participant is required to bring a unique, worthwhile idea to be discussed by the group. The idea should be something you've found to be useful as a way of identifying market opportunity. The idea should be market/trading focused, not one of trading psychology. I will be bringing some of my original market research as my ideas to share. Opinions about market or stock direction and simple chart or indicator patterns that one could obtain elsewhere would not be suitable ideas to bring. The focus is on fresh, useful perspectives. If each person brings one good idea, the entire group will go away with a very worthwhile set of ideas and professional contacts. I will be limiting participation to a small group to facilitate in-depth sharing and discussion. If the interest is high, we can do multiple networking events. I'll try to group participants by their trading styles and interests. I will get back to everyone and coordinate the event from there. I recognize that not everyone is in the greater NYC area, and not everyone is available after market hours. My hope is that it will be possible in the future to hold networking events at other times and locations. I also hope that this becomes an inspiration for traders to coordinate networking events in their own areas. Comments to this post can be used to reach out to other interested traders in a geographic area. How Can Competent Traders Become Great Traders? A savvy reader recently asked a good question in a comment to a blog post. He wanted to know what a competent trader--one who is capable of breaking even after expenses--most needs to do in order to become a great trader. Should he spend more time in deliberate practice, focusing on specific skills? That would lead him to be more active in the market and could adversely affect his profitability. Or should he focus on his profitability, limit his number of trades, and thus have less practice time in markets? My immediate reply is that veering away from what makes you profitable--getting away from your best practices--would not be practice. What is most important is that your good trading actually be your practice. That means, per the recent post, that you dissect your performance and identify precisely what you are doing well (so that you can replicate it) and what you could do better (so that you can improve upon it). 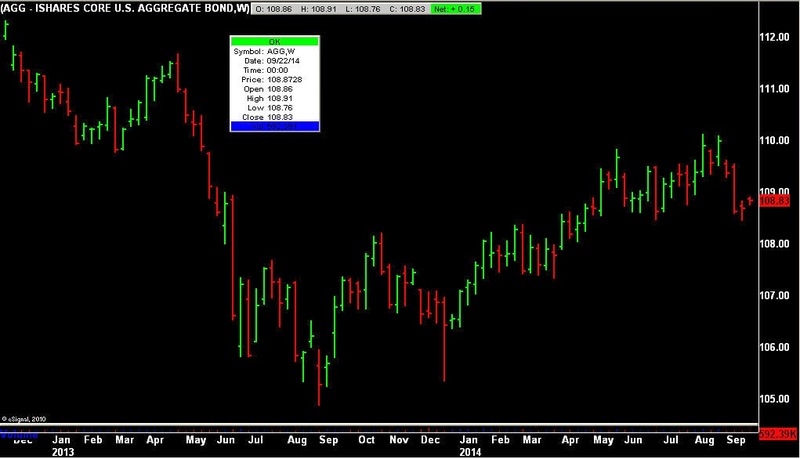 The key here is turning your observations regarding strengths and weaknesses into specific plans and goals that become actionable in subsequent trading. That is what turns mere review into deliberate practice. 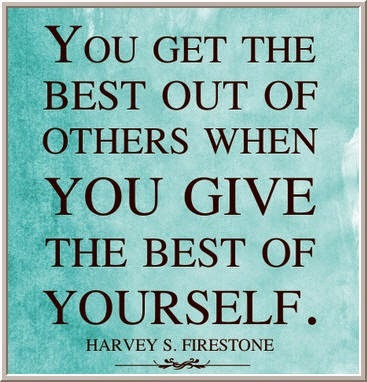 It also means that your best trading becomes your best practice. Now suppose you want to try something new in your trading. In that situation, it can be very helpful to return to simulation mode outside of trading hours and rehearse how your idea would play out in a moving market. I recently came up with an idea for an entry pattern that was unique. I spent the better part of a weekend morning reviewing past markets and seeing how the pattern played out over the past couple of years. That helped me refine the pattern considerably and now I'll be ready to try it out in real time with a one or two lot. Crawl-walk-run. Turn the trading into practice, but don't allow practice to interfere with profitability. Simulation mode provides all the experience with none of the risk. You can always add the risk element by trading the new ideas in small size. To sum up, more trading is not necessarily more practice. Indeed, more trading can instill bad practices. And more time in front of screens is not necessarily more practice. 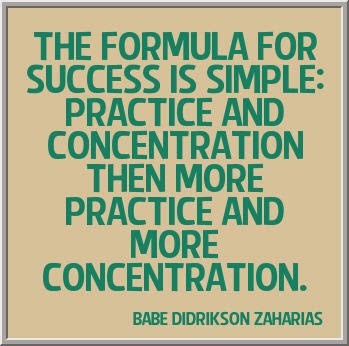 Deliberate practice means doing, obtaining feedback on results, and then correcting performance. If you're a competent trader wanting to become a great trader, you need to identify what you already do greatly and leverage that into more consistent success. Once you're consistently profitable, your further financial success may well come from managing more capital, not from continually tinkering with your trading. Further Reading: What Makes an Expert? 1) How honest are you? - You'd be surprised by the number of track records that are inaccurate. There are ways a good recruiter can identify this, but as we saw with the Madoff scandal, what looks too good to be true usually is. Overfit system results are another example of dubious track records. A valid track record is independently verifiable. One candidate I heard of produced a seemingly stellar track record with multiple years of solid earnings. When the due diligence process called for several years of IRS returns to verify income, the candidate mysteriously dropped out. We can trust in the Lord, but all others should have verifiable track records. 2) How correlated are you? - Are you basically following general market returns, or are you adding alpha with something unique in your trading process? Low correlations often speak to the creativity of a trader's idea generation. 3) How much do you make on a risk-adjusted basis? - If you are correlated to the general market, then you want to show that you are making more per unit of risk taken than the general market affords. A high Sharpe ratio suggests that you not only make money, but do so consistently, with solid risk management. 4) How well do you perform across market conditions? - A good track record is long enough to demonstrate your performance in volatile and non-volatile markets; during uptrends, downtrends, and ranges; and during different market regimes. Are you a one-trick pony, making money only in one kind of market, or can you be profitable across a variety of market conditions? 5) How much do you draw down? - This is part of performing on a solid risk-adjusted basis, but captures more specifically how you avoid blowups. A good track record should demonstrate that you play good defense as well as offense. 6) Where do your returns come from? - Do you make your money predominantly from one market and one kind of trading, or do you employ multiple strategies across multiple trading instruments? Do you profits come more from shorter-term trading or longer-term holds? Do you make more money in morning trading if you're a daytrader, or in the afternoon? 7) How well do you trade size? - Are your largest trades your most profitable ones, or do you tend to lose money when you're more aggressive? Does conviction in an idea lead you to trade it well, or does it beget overconfidence and poor risk control? 8) Is your performance getting better or worse over time? - Performance always rises and falls, but if you see steady improvement, that suggests a positive learning curve. A steady decline from a successful trader can be a sign that a trading strategy that worked well at one market period no longer is yielding positive expected returns. 9) Are there patterns to your performance? - Look at periods where you have undergone personal stresses as well as positive periods in your life. Do these correspond to trading performance? Do you tend to trade well after a period of flat performance or drawdown, or do the losses tend to snowball? After winning periods, do you tend to hold onto your winnings or give them back? Trading patterns can be great ways to identify psychological patterns? 10) If someone else had your track record, would you give them your money to invest? - That's where the rubber hits the road. If you wouldn't invest in someone else with your track record, perhaps you should not be overconfident in allocating your capital to your own trading. Viewing your performance objectively is a great way to determine how much risk you should take in your trading. The recent post looked at sector correlations in the stock market, which were helpful in identifying the recent peak in stocks. Above is a chart of rolling 20-day volatility across the major stock market sectors. We can see a similar pattern of low cross-sector volatility in advance of market peaks and high volatility at market bottoms and lift-offs from those bottoms. Note how volatility has trended lower across the sectors, recently touching a new low at recent market highs. We have since bounced higher in volatility, but have not broken the pattern of generally lower highs. As long as that pattern remains intact, corrections should be relatively modest both in duration and extent. Indeed, a study of market corrections as a function of volatility regimes is quite useful: expectable declines in lower regimes are quite different from those in higher ones. Of course, this pattern will change at some juncture and we'll see sustained upward movement in volatility. We actually bottomed in VIX back in July, though realized volatility across sectors continues its downward pace. Because volume is highly correlated with volatility, an early tell of changing volatility regimes will be a breakout in share volume. As long as volume remains within recent parameters, I don't expect market action wildly different from the recent past. 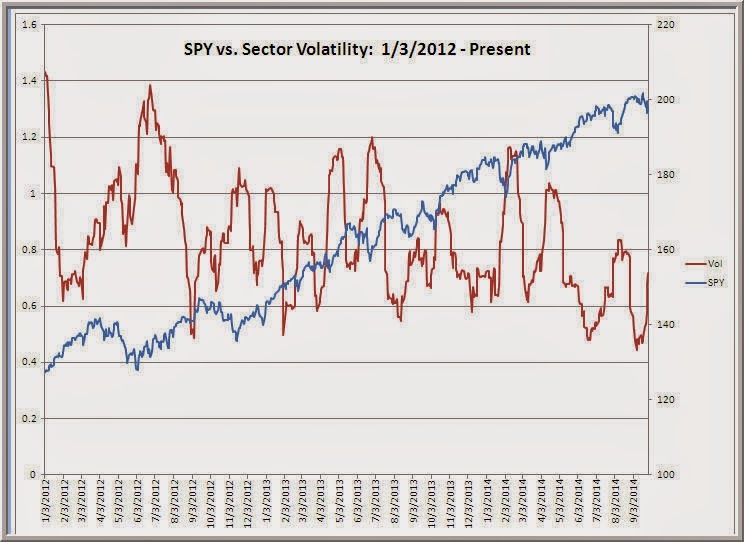 Short-term returns in SPY have been quite sensitive to volatility. Going back to 2012, when sector volatility has been in its uppermost quartile (highest volatility), the next five days in SPY have averaged a gain of +.95%. When volatility has been in its lowest quartile, the next five days in SPY have averaged a gain of only +.04%. Adjusting volatility readings for the downward drift is useful in detecting relative volatility highs and lows and then gauging the impact of volatility on forward price action. On that basis, we are nearing, but not yet at, top quartile relative values of volatility. I've received more than a few messages lately wondering if we're "due for a bounce" or if we've reached a bottom. It's easy to throw ourselves into tizzies trying to catch precise price highs and lows. I prefer to think of topping and bottoming as processes, connected by market cycles. 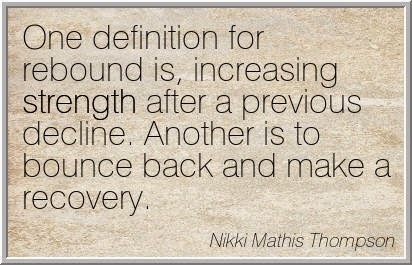 Rather than ask if we've hit the bottom, I'd rather identify when we are undergoing a bottoming process. First I want to see that we've made a momentum low--a point of maximum negative breadth--and then I want to see how key measures (such as sentiment, correlation, etc.) behave on subsequent price weakness. Even a seeming V bottom has a process to it, albeit one that is relatively compressed in time. Let's take an example. As of yesterday's close, fewer than 10% of SPX stocks were trading above their 3, 5, and 10-day moving averages. Going back to 2007, there have been only five non-overlapping situations in which this has occurred in a sub-20 VIX market. Those dates are 2/27/07; 6/6/11; 4/9/12; 6/5/13; and 1/27/14. This is clearly too small a sample for statistical analysis, but will illustrate an important qualitative point. After three trading sessions, SPX was up four times and down only once. All five occasions posted a higher close within three trading sessions. However, after five trading sessions, only one occasion was trading higher and four were lower. Four of the occasions posted a lower close within three trading sessions. So are we due for a bounce? Probably. Have we made a bottom? Not necessarily. Indeed, if you look at the forward price paths of the five dates listed above, you'll see a pattern of bouncing higher, moving lower over a period of a number of days. It is not uncommon for downside momentum to dissipate, even as we make subsequent price lows. Eventually that downside momentum wanes to the point where price cannot move lower and bulls are empowered to take advantage of the situation. Shorter price cycles lead to very short bottoming processes; longer cycles lead to more extended bottoming. The bottoming process for the very large preceding cycle extended from October, 2008 through March of 2009. 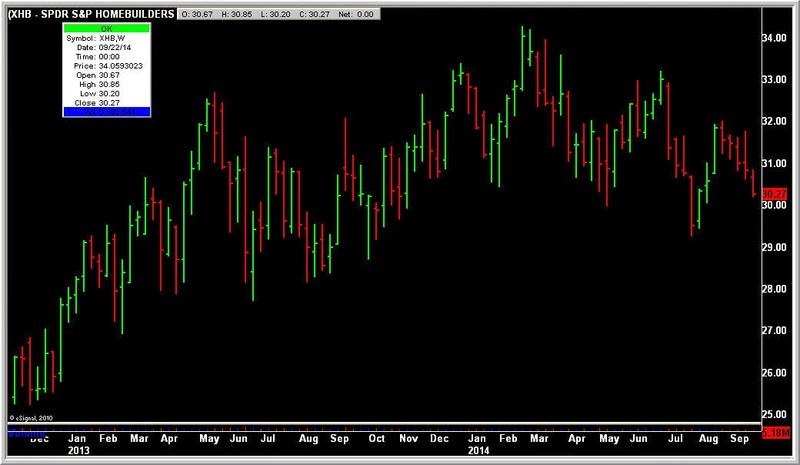 The bottoming process for the recent low in early August was just a few days. Identifying the kind of cycle we're in provides clues for how extended a bottoming process might be. (The same is true of topping processes). My chips remain off the table, but with bearish sentiment (equity put-call ratio above 1.10) and stretched downside breadth and rising volatility and correlation, I'm on the lookout for those indications of bottoming. In Part One of this interview series, Dr. Ted Hayes talked about two drivers of elite performance. In Part Two of the series, he spoke about some of the personality contributors to success and how those vary across one's development as a professional. In this third and final portion, he talks about the implications of his research findings for the hiring of successful traders. Brett: Based on your research, if you were hiring a trader to manage your money, what is the one personality characteristic you'd most look for? What is the one skill you would most emphasize in your search? Ted: Picking just one? Brett, this is tough, but overall the right talent development model would select for resilience and nurture conscientiousness. For a senior hire, emotional approach to risk is important and conversely at the junior level I’d be unsurprised to see the overly risk-taking crash — something men do routinely and women do not do. And I say that as a man, so, sorry guys! Brett: What do you think trading firms could do better in hiring successful traders? Ted: First, do not try to develop a model to fit a senior trader, especially only one person. Second, think more about a talent model for a successful cohort in your firm maybe more at the junior or mid-level, because that’s who you want more of. Third, assess each hire and develop a talent plan to ensure that person gets the behavioral practice s/he needs. Normally in HR the saying goes that you hire for skills and fire for personality; knowing that, flip the equation - hire for potential and fire for lack of execution. Fourth and finally, trading firms should actively seek out coaches who can work with traders at multiple levels of development. Brett: Of course, I have to ask the age-old question: Do you think successful traders are made or born? How much of performance is acquired skill and how much is inborn talent? Ted: Until this year, the reigning model in the psychology of human performance was that high performance was a function of deliberate practice, which is intensive study over thousands of hours — the so-called “10,000 hour rule” — with expert feedback. And while deliberate practice is certainly conducive to high performance, very recent research shows that there is a sort of interaction in that those who already have a high level of talent (cognitive ability, personality, physical) are those who will benefit from deliberate practice. Not just anyone can become a ballerina or chess grand master or “super-trader” just by trying really hard for a long time. It’s a psychological case of the ‘rich getting richer,’ or, life is still unfair. But it’s not all unfair; for example, being really talented and lazy is a recipe for disaster. So the answer is that the potential for successful trading is “born” but the practice of trading mechanics is what makes for high performance. And when people don’t live up to potential after you’ve given them deliberate practice, separation is the fairest melancholy ending of all. Brett: Thanks very much for participating in this interview. What projects are you working on presently and what are some of the research areas you think are most promising? Ted: Working with Zolio is rewarding because it’s a great educational opportunity for the participants as well as a trading performance data bonanza. It’s a very smart way for managers to select for results and not for a resume. While Zolio is in its early stages, I’d like to see a more of a playful approach to talent development, recognizing the dynamism of trading. Finally, than you, Brett, for interviewing me — I hope something we’ve discussed sparks interest out there among your reader, and I can’t wait until your new book comes out! In a broader sense, however, Zolio and Ted are building something even larger: a growing database of personality strengths, cognitive abilities, and trading performance. Over time, this is enabling Ted to unravel patterns of success. For example, it might be the case that successful active daytraders display different patterns of strength than position traders or pairs traders. The database will also uncover the strengths needed at various phases of a trader's development. This is invaluable information both for traders and firms that hire them. Finally, Ted discusses recent research that suggests that not all performance success can be attributed to hard work and practice. Native talents count for a lot, as well. We are not born as clean slates; from early in life, strengths manifest themselves. Some people are highly social and interactive; others are highly analytical. Some seem hard-wired for faster thinking grounded in pattern recognition; others display an early bent for slower, deeper thinking. The challenge of performance is figuring out who we are and what we're good at and then finding a platform in which we can leverage those talents through deliberate practice to achieve meaningful success. Thanks again to Ted for a most enlightening interview. Above is a measure that I've been working with lately that I call breadth volatility. The indicator is created by tracking the percentage of stocks trading above various short term moving averages and then calculating the standard deviation of that series. What we find is that breadth volatility tends to be low ahead of cycle peaks and crests as markets make--and rally from--bottoms. Going back to 2012, when breadth volatility has been in its highest quartile (greatest volatility of breadth), the next five days in SPY have averaged a gain of +.54%, much greater than the +.10% for all other occasions in the sample. 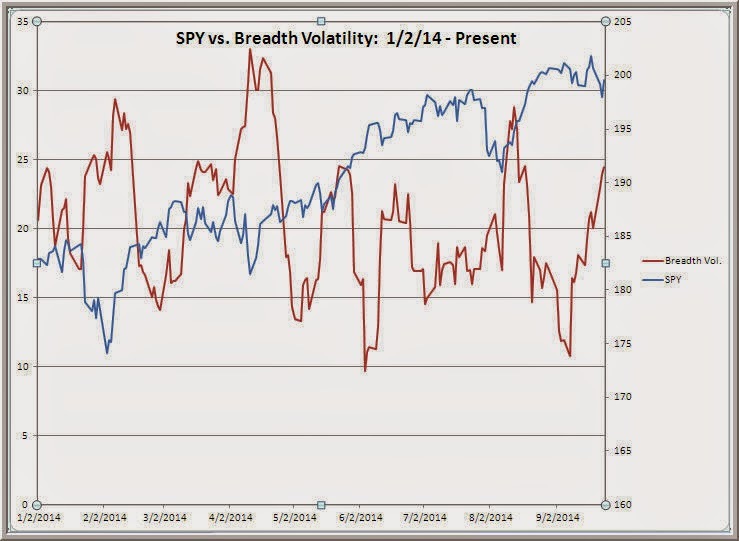 Interestingly, the breadth volatility measure shown above correlates only .41 with VIX going back to 2012. That's a significant correlation to be sure, but suggests that VIX only accounts for 16% of the variance in breadth volatility. Indeed, when I've tracked breadth volatility for specific VIX regimes, the predictive results with SPY have been quite good. As you can see from the chart above, we made a low in breadth volatility ahead of the recent price peak in stocks and now have been trending higher as the market has sold off. As of yesterday's close, we were not yet at levels associated with intermediate-term market bottoms. One of the great disappointments I encounter when I read writings on the topic of trading psychology is that they invariably touch upon the same themes: discipline, controlling emotions, etc. Having worked with traders and portfolio managers for over a decade now, there is so much more to the psychology of trading than "sticking to your process" that I decided I had to write a book about what I was experiencing but wasn't reading. The title reflects that interest: Trading Psychology 2.0: From Best Practices to Best Processes. I think Ted Hayes hit on something important in his recent interview. He pointed out that the personality traits relevant to success among early career traders are different from those that generate success for experienced ones. Perhaps so much writing concerns discipline and emotional control, because those are the dominant concerns of the new traders who buy the books, haunt the websites, and seek the help. In adapting to different markets by leveraging their strengths and generating new ideas, successful market participants are not so different from successful businesses in fast-changing industries, such as technology or social media. When markets change from year to year, stasis is a formula for failure. The successful trader, like the successful tech firm, must constantly innovate. Moreover, once traders generate those innovations, they must turn best practices--what they do that is successful--and turn them into robust, best processes. I think this is very, very important: What makes a trader successful is discipline: doing the right thing with fidelity. What keeps a trader successful is innovation: doing new things and turning them into disciplines. Conscientiousness makes for success, but it is openness that makes for adaptation. Trading psychology as a field has done a fine job of articulating the importance of discipline. My hope is that the new book will broaden the discussion to include a research-informed look at mastering change and innovation. Brett: What does research tell us about personality traits and performance success? Ted: The current best model of personality is known as the “big five” factors of personality. This is an approach in which five personality aspects based on adjectives can predict what you’ll do. The five aspects go by the acronym OCEAN: Openness to new experience, Conscientiousness, Extraversion, Agreeableness, and Neuroticism (or its opposite, emotional stability). You can find these adjectives in all languages and culture groups. Conscientiousness predicts work performance in all jobs, thus one should be curious about what it is. Conscientiousness includes planfulness, rule abidance, goal-setting, achievement orientation, and focus on details. In short, it’s self-control. And that is important for many aspects of life where orderliness, hard work, and avoiding distractions is valued. So in trading, especially at the entry levels, we need conscientiousness to help establish and follow routines, attend to details, etc. Traders who aren’t careful to chart assets, make journal entries, etc. are ineffective. Traders who get out of their routines (e.g., after the birth of a child, after illness, after a divorce) need to re-establish them before they can become productive again. Emotional stability plays out through the more apt term resilience. You will lose money in trading at some point; you will, we hope, have some huge winning positions; there will be days when nothing happens, and there will be days where everything happens seemingly all at once. These events will test you. The capacity to modulate one’s one emotional state, maintain perspective, pull back after surging ahead and pull up when in a spiral — all are aspects of resilience. Brett: That is very interesting, Ted. It calls to mind the Angela Duckworth research at the University of Pennsylvania. She and her team found that "grit"--resilience in the face of setbacks--and self-control were the two most powerful predictors of success. Ted: Related to resilience, particularly in trading, is one’s comfort with taking risks (I refer to this as ‘risk tolerance’ though I appreciate that term might be misconstrued). It’s a combination of openness to new experience with emotional stability. In chess, for example, sometimes you sacrifice a knight to take a bishop. In trading you might lose some trades to test out a new market model you’ve developed. Some people prefer the tried and true, and can build a trading approach around that comfort zone. In either case, the extent to which you can come to terms with a balanced approach to risks for the sake of rewards will benefit you and build your own mental Sharpe Ratio. Extraversion, which refers to being energize by having a broad network of friends and associates, and agreeableness, which refers to the extent to which you seek and create and enjoy harmonious situations, can be important in some careers such as trading in building one’s reputation for trustworthiness and collegiality. Brett: What I've found is that extraversion and agreeableness very much influence how traders work. More introverted market participants often engage markets via research and study. More extroverted traders are more apt to source ideas via personal contacts, social media, and other interactive means. Some of the most extroverted and agreeable traders I've met have been quite effective working as part of teams. You've conducted a number of research projects concerning traders in financial markets and what makes them successful. What findings have been most interesting and surprising to you? Ted: The dynamism of trading. You’re competing with and against people world-wide all the time and work in markets beyond your control, and this places extraordinary demands on traders at different points in their psyches. Trading seems to have multiple levels based on maturity and style. For example, I work with Zolio where we have ‘pre-traders,’ 20- to 28-year olds who are not professionals engaging in trading on a simulated platform. Among them, mechanics and resilience are critical for success, but they’re also on a very steep learning curve. We also see pre-traders overly risk-seeking, with predictable results. Entry-level traders at firms I’ve worked with do better with, again, conscientiousness and resilience. But more senior traders are distinguished by their emotional approach to risk. That’s because these people have survived to that point, but usually they also have a sizable portfolio and it’s about gaining enough returns relative to the leverage and size of one’s positions. It’s unusual to see different talent models predominate at different points in a career. Again, a very similar dynamic compared to intelligence analysts. So let's step back for a moment. Ted is saying something extremely important that, to my knowledge, has not been emphasized in the trading psychology literature. "Different talent models predominate at different points in a career." In other words, the traits that make a beginning trader achieve profitability are different from those that make a profitable trader a world-class talent. It is possible to have the skills and traits needed to learn trading and become competent, yet other abilities and qualities may be needed to turn competence into proficiency. This very much fits with my experience working with traders. Early career traders I worked with in Chicago struggled with issues of discipline (conscientiousness) and taking/growing appropriate risk (resilience). The experienced portfolio managers I've worked with more recently already have developed risk management skills and solid work routines and have demonstrated an ability to take appropriate risk. Their greatest challenge has been adapting to changing market conditions, which Ted would subsume under Openness to new experience. Each developmental level seems to call upon different success ingredients. 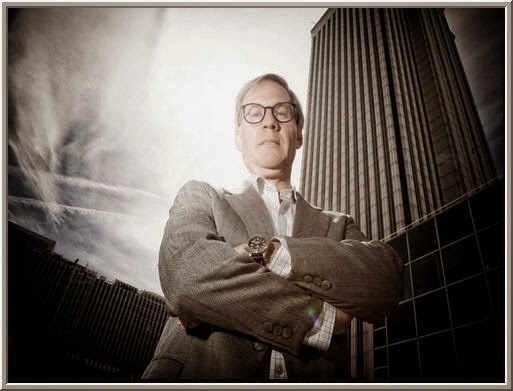 In the third and final segment of the interview, Ted will identify some of the implications of his research observations for traders and trading firms. Above is a way of looking at breadth in the SP500 Index that I have found useful in tracking short-term market cycles. Breadth bottoms at or near cycle price lows and tends to top ahead of cycle price peaks, providing a nice heads-up on weakness. The recent waning of breadth was an important factor in anticipating the latest market weakness. The indicator is a multiperiod breadth measure. It consists of the number of stocks in the SP500 Index that are making fresh five-day highs minus five-day lows added to the number making fresh 20-day highs minus 20-day lows and the number making new 100-day highs minus 100-day lows. (Data via the excellent Index Indicators site). 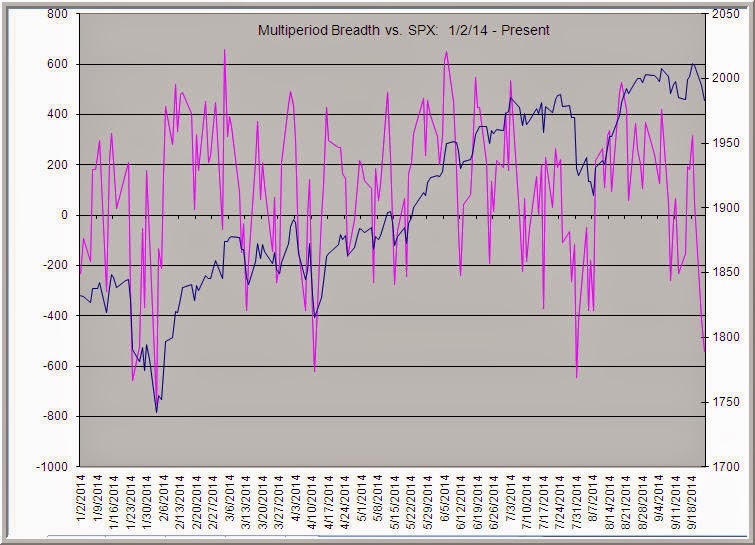 Going back to 2012, when the multiperiod breadth has been strong (in its top quartile of daily readings), the next five days in SPX have averaged a gain of only +.05%. When multiperiod breadth has been weak (in its bottom quartile of readings), the next five days in SPX have averaged a healthy gain of +.78%. With the recent selloff, the breadth measure is now in that bottom, weakest quartile, consistent with oversold levels that have averaged rallies over the subsequent week. As bond prices (AGG) have failed to make new highs along with stocks in recent months (top chart), we see sectors of the market dependent upon interest rates showing lagging relative performance from the bond peak forward. Those include housing (XHB); real estate (IYR); and regional banks (KRE). 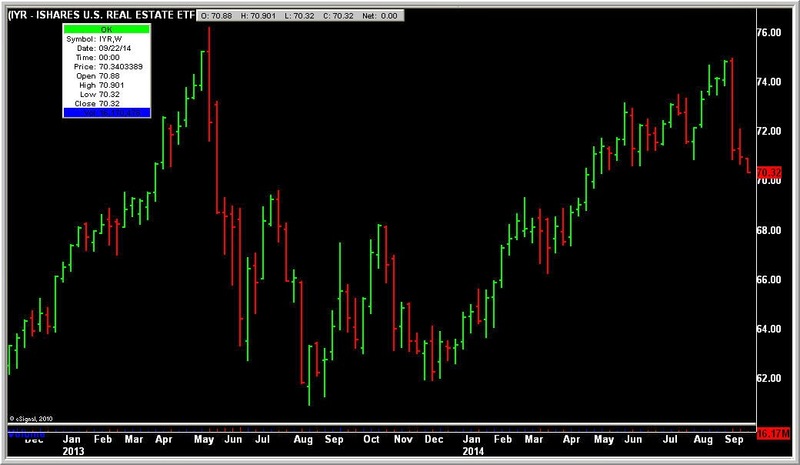 I notice some people have made a bullish case for this market based upon recent strength in the financial ETF, XLF. That, of course, is dominated by large cap stocks and those have been the recent outperformers, as we've seen in the recent post. The broad list of financial shares has not fared as well, per the recent performance in KRE. 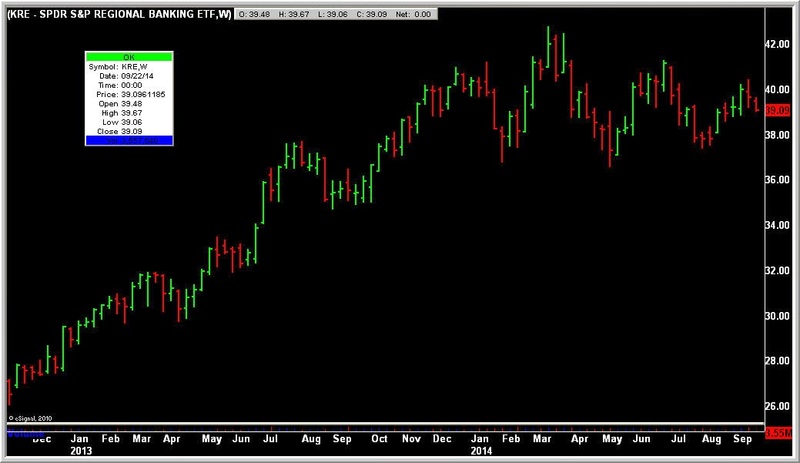 Indeed, the small cap financials ETF (PSCF) failed to confirm recent new highs and have gone nowhere since late last year. Even within stronger sectors, we're seeing evidence of thinning participation in the market strength. Ted Hayes, Ph.D. has spent a career studying human performance and what makes successful people tick. Most recently he has been studying trading success as part of a research effort at Zolio. Zolio is unique in that it is a real-time simulation trading platform that enables talented up-and-coming traders to demonstrate their skills for investment banks, hedge funds, and other trading firms. Ted is leading an effort to study trader success at Zolio, and he has arrived at some interesting conclusions. Ted is also an Adjunct Assistant Professor of Organizational Sciences at George Washington University and has served as a Senior Research Director for the Gallup Organization. My interview with Ted will be in several installments, as he had a great deal to share. Brett: Hi, Ted. Perhaps you can tell readers a little bit about yourself and your areas of interest as a researcher and psychologist. Ted: Sure, thanks for this conversation Brett! 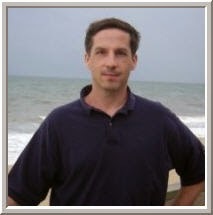 My name is Ted Hayes and I am a research psychologist based in Northern Virginia. My interests are in the nature of human performance, especially among higher performing people. The one question I want to answer is, what is it that makes people successful? My first internship was to help study predictors of success for U.S. Navy Explosive Ordinance Disposal divers. Talk about a high-stakes environment! And in that study we found that measurable aspects of personality predicted training success. I was hooked on psychological measurement from then on. Performance among traders is different from performance among EOD divers but the same types of human performance attributes are linked to positive outcomes. That’s one of the exciting parts of my work. Brett: What are some of the most important factors that determine a person's satisfaction and performance in a career field? Ted: I’ll start by defining some terms to ensure that we (you, me, the readers of your blog) have a common frame of reference. Vocational interests are expressions of what an individual finds rewarding in terms of social interaction, external rewards (i.e. remuneration) and social status, and a sense of personal meaning. For example, many people go into finance or trading because they like the potential for high income; an example would be Charles Schwab. The same type of people, interestingly, would make great intelligence analysts, and in fact the traders and intelligence analysts I’ve worked with have very similar talent sets. But while the money certainly could and should be a factor in vocational choice, you, Brett, have written about how trading involves ‘the rage to master’ — I love that term. So one could find trading to be a rewarding career because of the desire for high income but maybe you’ll be happier longer term because you want to understand markets, enjoy being the master of your own fate, find satisfaction in calculating the right risk ratios. Brett: So what you're happy with and what you do well could be different things. Ted: Yes, performance is very different from satisfaction. For example, if you want to run a macro fund but you’re starting out in day trading, well, that won’t last long. So that’s why from a research perspective we expand the toolkit beyond vocational interests to measure the psychology of human performance. Cognitive ability enables one to make sense of data, integrate new information with previously learned information, and retrieve information to create new work products. But before your readers with perfect SAT scores or A-level exams start congratulating themselves, let’s acknowledge that being among “the smartest guys in the room” doesn’t mean you’ll be successful; just look at what high IQ did for Enron. And as you and I know from our work with traders, a lot of successful traders think people with academic smarts are, well, stupid. What distinguishes “smart” from “successful” is good decision-making. So the question is, why and how do people make good decisions? Brett: So performance is tied to our abilities to process information. Ted: Yes, but this is only part of the picture. One could ask, do people really only make judgments based on data and algorithms? Of course not. Deliberations and decisions reflect our tendencies, preferences, allegiances, anxieties, values, biases, temperament, and motives, or, in other words, our personalities. Personality drives behavior, especially in work settings. World-wide empirical research over the span of 100 years has settled this issue at least to that extent. Personality reflects your interests, temperament, values, etc. as filtered by your social skills. In other words, your reputation is a proxy for your personality. In fact current research shows that other people’s ratings of you on personality tests are better predictors of your work performance than are your own personality test ratings of yourself. Let's step back for a moment and reflect on what Ted is proposing. He is identifying two broad factors that contribute to performance: cognitive ability and personality. Both are crucially involved in decision-making. 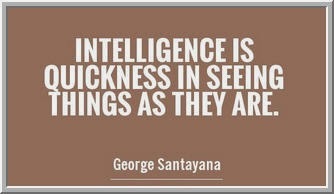 Cognitive ability breaks down into fast thinking--the kind of pattern recognition we see among successful short-term traders--and slow, deep thinking. That's the kind of analysis that we see among global macro portfolio managers. It is difficult to imagine that a trader can be successful without having at least one of those areas well-developed. On the other hand, all the skills and knowledge in the world will not translate into performance if those cognitive assets are not supported by personality traits. As Ted points out, we all know very smart people who are not top level performers--in markets or elsewhere. It is the ability of personality traits to channel cognitive ability that contributes to world class performance. In the next segment of the interview, Ted will shed light on the specific personality traits that are associated with performance success. What Can Help You Identify Downside Trend Days in the Stock Market? * Lopsided advance-decline ratios on the day; many more stocks declining on the day than advancing. This suggests the weakness is broad. 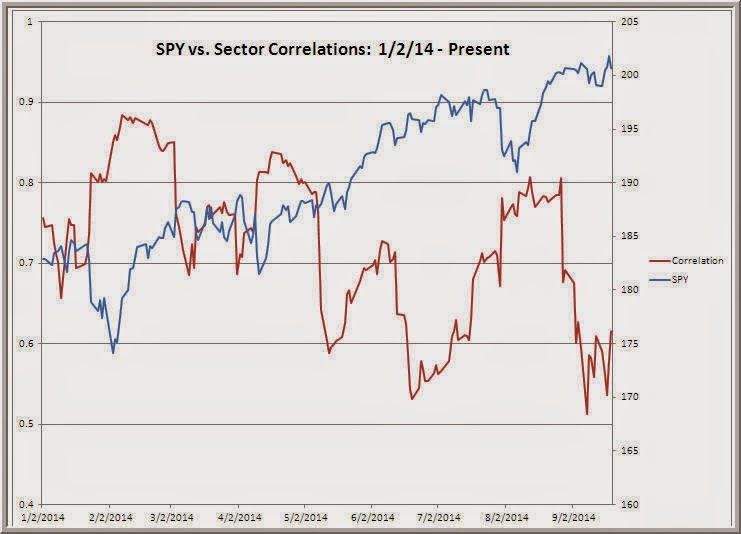 Note also it implies that correlations are rising among stock sectors. 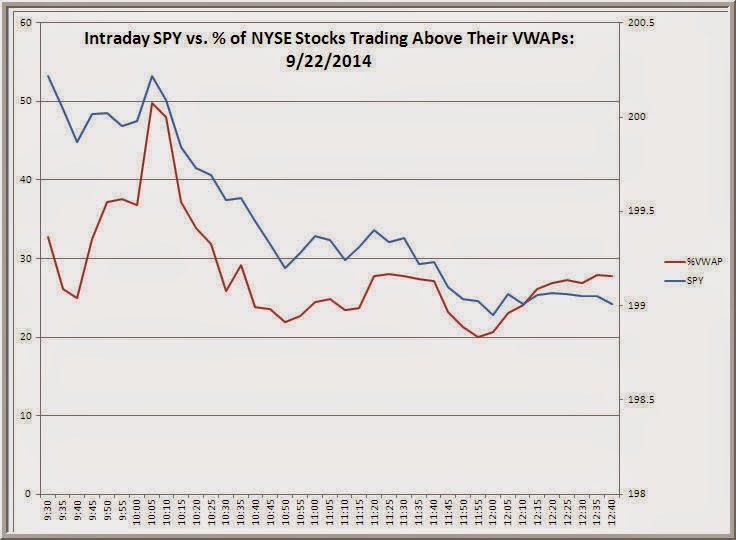 * Persistent low percentage of stocks trading above their day's volume-weighted average price (VWAP), per the chart above. * Many more stocks making fresh lows for the day session than highs throughout the session, suggesting that weakness is persisting. * Cumulative NYSE TICK negative on the day and trending lower, with relatively few TICK readings above +500 and numerous readings below -800. * Weakness across stock sectors, generally with "beta" sectors weaker than defensive ones. All you can do is put the odds in your favor. When you see unusual weakness or strength early in the session, it is generally worth considering the possibility of a trend day. Here is a chart of rolling 20-day correlations within sectors specific to SPX stocks, as highlighted in the recent post. What you can see is that the sectors have become less correlated over the past year, but there have been meaningful swings higher and lower. Specifically, we've seen correlations bump up when stocks have sold off and we've seen the lowest correlations during periods of market topping. As mentioned in the prior post, low correlation markets have tended to produce flat returns in SPY during the recent bull market; superior returns have been achieved by buying relatively high correlation markets. We can see from the chart above that we have recently seen unusually low levels of correlation, which have trended higher in the past few sessions. Along with the failing breadth, this is consistent with a topping phase of a market cycle. Mindfulness meditation is a practice in which we develop a non-judgmental present-centered awareness. In the state of mindfulness, we observe what is, without reacting to it as good or bad and without coloring it with thoughts and feelings of past and future. Mindfulness can be thought of as a means toward non-attachment, separating our desires and fears from what is. Think about what this means: In the heat of market activity, we are most likely to be activating those flight or fight centers that help us deal with emergencies. Just as we want to be most planned and deliberate, the blood flows in our brain are moving away from the centers that would execute plans and toward centers that would lead us to be more reactive. The challenge is to stay mindful in the midst of fast moving markets and rapid shifts in P/L. A recent thorough research review found mixed evidence for the effectiveness of mindfulness meditation. Mindfulness was more effective in reducing anxiety, depression, and pain than in improving positive mood and attention. I find this interesting, as it suggests that achieving a detached awareness may be useful in reducing both physical and emotional pain. It may well be that avoiding stimulation of those fight-flight responses is helpful in dealing with painful situations. Mindfulness may yield benefits to traders above and beyond those studied in the research literature, including enhanced access to intuition and improved performance under stress. A new book by Gary Dayton also suggests that mindfulness can be useful in reducing trader susceptibility to bias and in defusing negative emotions. In my own work, I find a great overlap between mindfulness work and self-management exercises performed with biofeedback. That makes sense, as early applications of biofeedback were directed toward children experiencing attention deficits. Mindfulness will not substitute for sound trading strategies with an edge, but it is difficult to imagine maximizing an edge without self-awareness and self-control. Practicing mindfulness daily is a great way to exercise the brain's ability to stay grounded in executive functioning even during the most adrenaline-filled occasions. 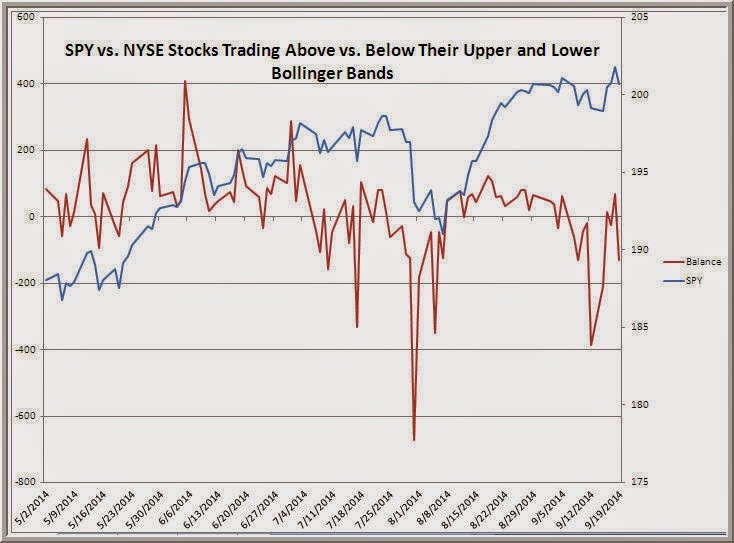 * We can add the above to the recent evidence of weak market breadth: The number of NYSE shares closing above their upper Bollinger bands minus those closing below their lower bands has been tailing off, failing to confirm recent price highs. In a new blog, Worch Capital offers a different and worthwhile perspective on divergences. * Thanks to @SpareRisk for passing along this golf feature relevant to trading on what it takes to succeed. Lots of good perspective on grit and deliberate practice. Love the part: "Hitting balls isn't necessarily practice. Practice should be purposeful." Great issue for reflection: Do we turn our trading into practice, and how purposeful is our practice? * Credit to @derekhernquist for noting this interesting article on how not all the returns from skilled money managers come from the same place. Very relevant to understanding--and leveraging--our own strengths as traders. * Thanks to @brussbowman for pointing out this article on mindfulness and the brain. Very relevant to trading: shrinking the "fight or flight" brain centers and building the centers controlling attention and concentration. More on this topic to come. * Excellent reading from Abnormal Returns, which does a great job of categorizing reads to help site visitors focus on the content most relevant to them, from investing and finance to health, football, and entertainment. Check out the podcast array as well--amazing what's out there for free. * Macro alert from Barry Ritholtz and David Kotok: Why Turkey belongs on the radar. By the way, Barry has been assembling a very impressive lineup for the Masters in Business podcasts. Why Do Traders Go on Tilt?